hapless and unmotivated stoner whose small-town life with his live-in girlfriend, Phoebe [Stewart], is suddenly turned upside down. Unbeknownst to him, Mike is actually a highly trained, lethal sleeper agent. In the blink of an eye, as his secret past comes back to haunt him, Mike is thrust into the middle of a deadly government operation and is forced to summon his inner action-hero in order to survive. Mike Howell [Jesse Eisenberg] spends most of his time getting stoned, sitting behind the register of the Cash & Carry and writing a never-to-be-published graphic novel about a superhero monkey. 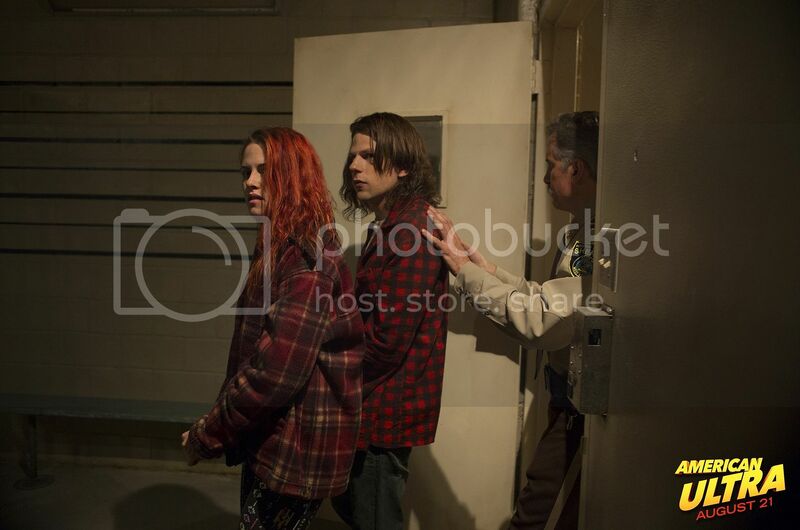 Someday he’d like to take his bail-bondsman girlfriend, Phoebe [Kristen Stewart], to Hawaii—if he can ever overcome the inexplicable panic attacks he experiences whenever he tries to leave the city limits. Unbeknownst to Mike, he is actually a sleeper agent created by the CIA, which has just targeted him for termination. As some of the agency’s deadliest assets are unleashed upon his sleepy town, Mike’s sympathetic former handler, Lasseter [Connie Britton], activates his latent skills, turning the mild-mannered slacker into a superhuman killing machine. As Mike’s once-simple life becomes an adrenaline-fueled chase, no one is more surprised than he is to discover his uncanny ability to turn even an ordinary spoon into a weapon of mass destruction. With an obsessed agent [Topher Grace] hot on his heels, the newly reborn super-assassin summons his inner action-hero to try and save himself and the love of his life from complete destruction. American Ultra stars Jesse Eisenberg [The Social Network, Zombieland], Kristen Stewart [The Twilight Saga franchise, Snow White and the Huntsman], Topher Grace [Interstellar, That ’70s Show], Connie Britton [Nashville, Friday Night Lights], Walton Goggins [Django Unchained, The Shield], John Leguizamo [Ridealong, Chef], Bill Pullman [The Equalizer, Independence Day], Tony Hale [Veep, Arrested Development], Lavell Crawford, and Stuart Greer. 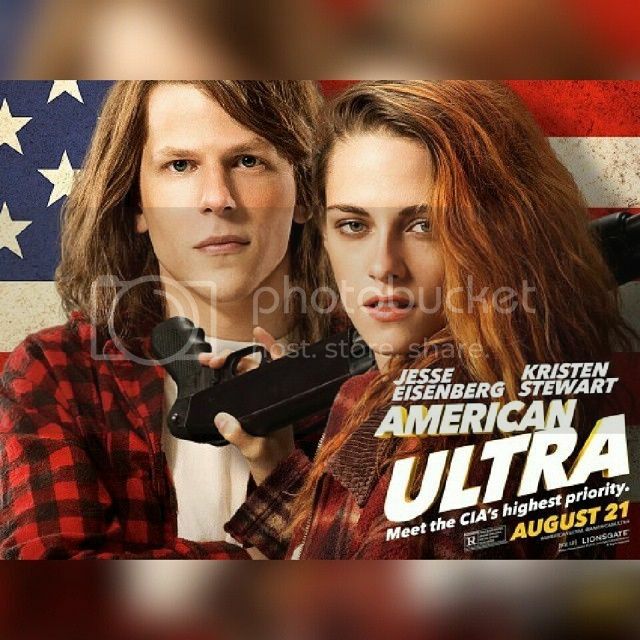 For the first five minutes of American Ultra, audiences may feel like they are watching a charming little indie film about two quirky characters—which is exactly what the filmmakers intended. Mike Howell, the movie’s main character, is a smarter-than-average but completely unmotivated slacker. He is stuck in a small town, working at the local convenience store and living a very ordinary life with his girlfriend Phoebe. When the action suddenly shifts from Liman, West Virginia, to CIA headquarters, something far more sinister than romance starts to take shape. A clandestine government program is about to rain terror down on a sleepy West Virginia town. The object of the attack is … Mike Howell? Nourizadeh, whose first film has established him as an innovative new talent in Hollywood, impressed the producers with his ideas for maximizing both the action and the humor in the script. The director’s eye for detail elevated an already strong script, in Alpert’s opinion. “The composition of the shots is unusually good, especially given the amount of action involved,” says the producer. 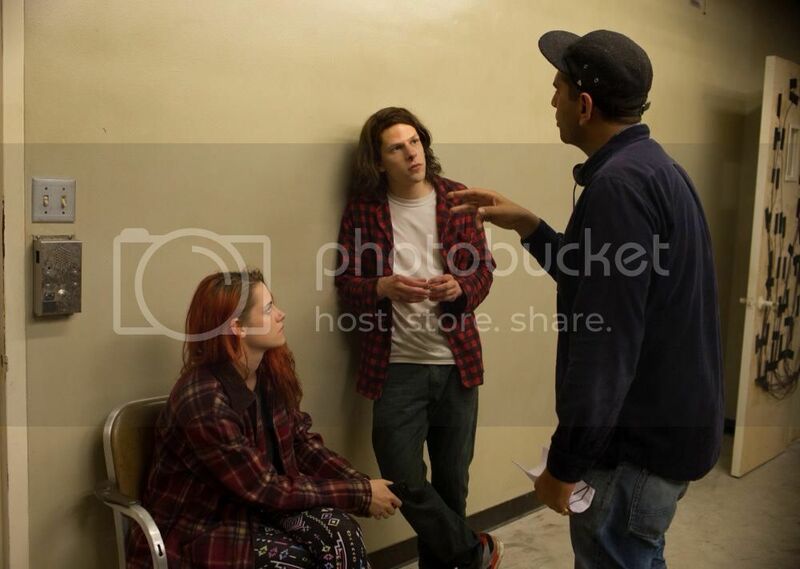 “Teaming Max and Nima up and then adding Jesse Eisenberg and Kristen Stewart to the mix feels like we’re looking at the next generation of great Hollywood filmmakers,” adds Alpert. As action heroes go, Mike Howell is an unlikely contender. He is completely dependent on his girlfriend, unable to cook a simple meal without starting a fire. He has been hired and fired from the same rundown convenience store more times than he can remember, and he gets arrested for possession so often that the police are on a first-name basis with him. Landis’ script keeps the humor completely genuine, says the actor. “Putting this very passive guy in the middle of an intense and violent world creates the potential for a lot of comedy. Mike is thrust into situations where he has to defend his and his girlfriend’s lives. As the film begins, Mike is about to discover he is part of a discredited government experiment known as Wise Man. Run by Victoria Lasseter, the program was pronounced a failure and its subjects had their memories wiped before they were put back in society. The single success was hidden in the tiny town of Liman, West Virginia. Now Adrian Yates, Lasseter’s recently promoted agency rival, has decided to mark his territory by eradicating every trace of Wise Man, including Mike. Britton fell in love with the genre-bending narrative as well as the finely tuned dialogue of the script. Goggins, whose intimidating presence has earned him roles in films including Django Unchained and GI Joe: Retaliation, says Laugher has a few more layers than most of the characters he is asked to play. “Laugher is a physical threat for sure, but he comes with some mental challenges that made it a lot of fun for me to play,” says the actor. “He has a signature giggle that signals the beginning of chaos. What was interesting to me was that Laugher is as much a victim of these circumstances as Mike. Yates is like a surrogate parent and he wants to keep Daddy happy. Like the other actors, Pullman was attracted by the script’s distinctive language and vivid characters. Nourizadeh’s only direction to Alonzo was to make sure that the audience believes that Eisenberg is capable of the action. “I didn’t want any kind of kung fu or crazy high kicks,” the director says. “To me, it had to be skillful, hand-to-hand, close-quarter combat. We had to really sell those punches, sell the way he grabs a gun, the way he uses weight and balance to his advantage. Kristen Stewart [Phoebe Larson] is one of the most accomplished, talented and in- demand young actresses in Hollywood. She recently became the first American actress to be awarded a Cesar Award in the Best Supporting Actress category for her role in Olivier Assayas’s Clouds of Sils Maria, in which she starred alongside Juliette Binoche. Stewart is currently in production on two films: The Untitled Woody Allen Project in which she will star alongside Bruce Willis and Jesse Eisenberg; and Olivier Assayas’s Personal Shopper. Most recently, she wrapped production on The Untitled Kelly Reichard Project and Ang Lee’s War/Drama, Billy Lynn’s Long Halftime Walk. Stewart will next be seen in the Drake Doremus directed film, Equals, which will also star Nicholas Hoult. Stewart can most recently be seen alongside Oscar® winner, Julianne Moore in Still Alice, Tim Blake Nelson’s Anesthesia, which premiered at the 2015 Tribeca Film Festival as well as Camp X-Ray. Stewart starred as “Bella Swan” in the hit franchise The Twilight Saga. The series has grossed over $3.3 billion in worldwide receipts and consists of five motion pictures. On top of that she starred in Universal’s box office winner Snow White and The Huntsman; and in Walter Salles’ screen adaptation of Jack Kerouac’s On The Road. Introduced to worldwide audiences in 2002 with her gripping performance alongside Jodie Foster in Panic Room, Stewart’s star continued to rise, hitting a milestone when she garnered the number one spot on the Forbes list of highest paid actresses in 2012. Kristen’s career has displayed a challenging assortment of characters in films including: Adventureland, Into the Wild for director Sean Penn, starring as Joan Jett in The Runaways, Welcome to the Rileys, The Cake Eaters for director Mary Stuart Masterson, The Yellow Handkerchief alongside William Hurt, What Just Happened, In The Land of Women, The Messengers, Zathura, Speak, Fierce People, Catch That Kid, Undertow, Cold Creek Manor, and The Safety of Objects.